The first word in the title of this exercise “Experiment” gave me freedom to play about. I was, until starting this course, rather dismissive of collage, thinking of it as “cutting and sticking” like in primary school. But I’ve shifted my view significantly, having looked at the work of artists who use it successfully, for example Day Bowman. My impression is that it works best with a more abstract approach, and that is not the brief here, so I was unsure how to start, but knew I wanted to try. As usual, I took some time to decide on my subject, and had to modify my initial idea as I couldn’t easily find any sunflowers! I so love them as a subject, along with thousands of would-be Van goghs, I know. i was surprised to see two works using sunflowers as their subject, in the Summer Academy this year. 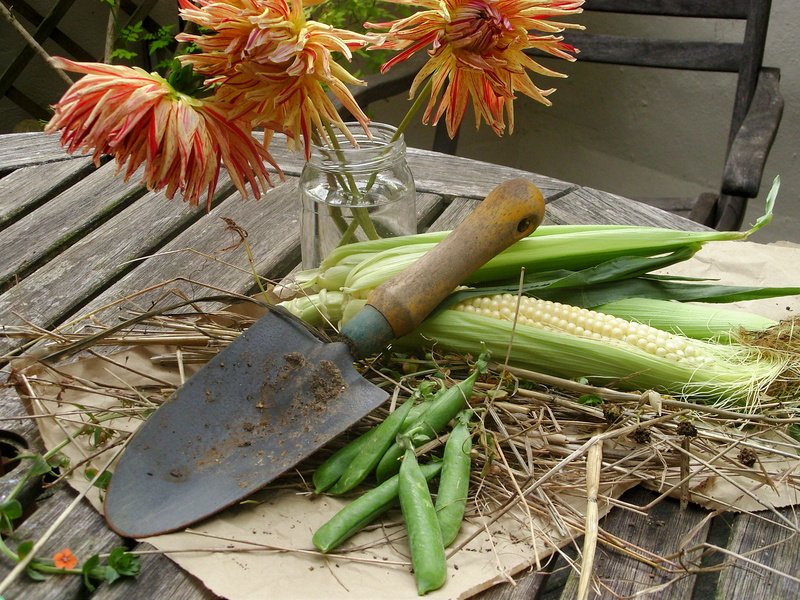 I opted for a maize cob, for its texture and dahlias, because they were there and have a similar shape to sunflowers, but are blowsier – quite impressionistic. Composition for Exercise 3 Project 4 Part 2. I have used torn newspaper, brown paper bag, straw and dried grass, glue, Liquitex acrylic ink, brush, biro, oil pastels and salt crystals in my work. My surface was brwon cardboard, as I needed the robustness to carry the materials .Given all of these materilas I’m confused about it being a “drawing”, but I understand this was what was required. I really enjoyed the experiment, but it took me a long time. I chose the dark blue newspaper for a few reasons. It reminds me of Van Gogh’s Sunflower series where he always uses blue (the complementary of yellow) in his compositions. I was influenced by the example work in the Study Guide, and because there were several sheets of varying blue tones in the paper. I wanted to create a rustic look with the straw, and have seen raised effects by sticking paper over objects, such as string, or creasing the collage paper, so I tried this, by using soem starw under the creased and torn brown paper bag. the colour of the brown paper blended well with the brown card which made life easier. I started with a rough pencil sketch and then added the well-diluted acrylic ink, so it was like watercolour, except the lines dried quickly and were permanent, which I like. I tried to find the dark tones first and then add lighter. 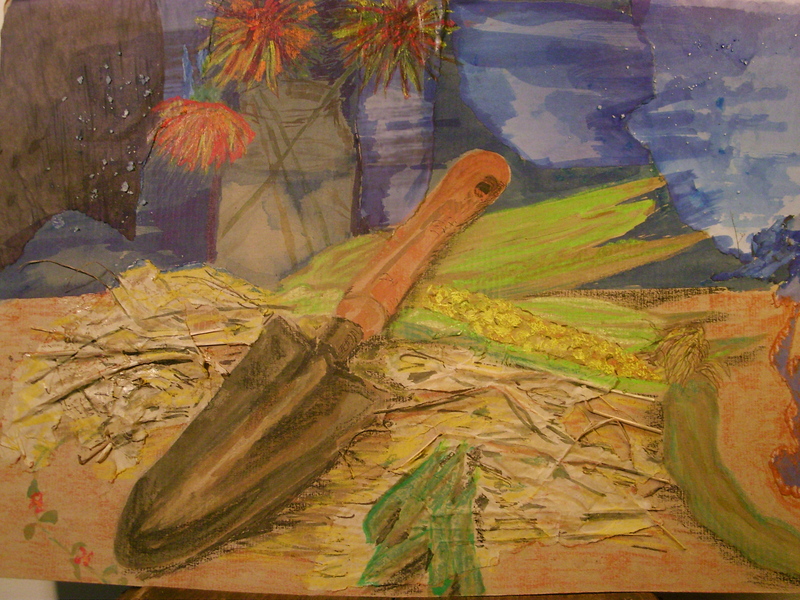 I came unstuck (literally) with the maize, as I had an idea I wanted to capture the texture of the grains. I tried sticking rolled soggy balls of soaked egg-box cardboard, but it looked very “primary school” so I took them off, when they were partly dry and left the imprint. I was quite happy with the result. The thing looked very washed-out at theis stage, with little coherence. I added oil pastel, using quite a lot of pressure. I used red biro to bring some dimensional quality to the dahlias. The weaknesses are the peas in their pods which are barely recognisable and could be taken out, and the trailing cob leaf cover on the lower right of the composition. Also, the light was mostly from behind the composition and the shadows were weak, but on the right, yet the remaining light in the sky in the drawing, is coming from the same side. This is probably a fundamental mistake, but one which occured because I was using the collage paper, not the true background. Overall, the drawing has an “impressionist” feel which I like and has very strong reference to Van Gogh, in the use of colour and the dark sky.